Texas Guitar Quartet presents Chamber Music of the highest quality! Texas Guitar Quartet performs classical guitar music with astounding grace and precision in their debut concert at Festival Hill with works by Mozart, Rossini, and Boccherini among others. Formed in 2008, the Texas Guitar Quartet has developed an exciting repertoire by commissioning new works and creating their own arrangements and compositions. Their daring arrangements, such as Beethovenâ€™s Egmont Overture, offer fresh perspective on works from other repertoires and push the boundaries of the medium. Join us for their first appearance on the Festival Concert Hall stage. (Repertoire is listed below.) 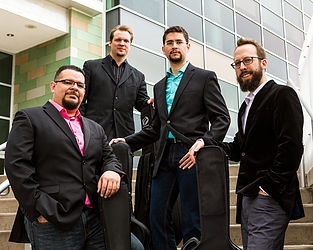 The Texas Guitar Quartet assembles the talents of Isaac Bustos, Jonathan Dotson, Alejandro Montiel and Joseph Williams II. As soloists, they have garnered acclaim on concert stages around the world and prizes in dozens of international guitar competitions. Together, they bring their unique passions and talents to an ensemble dedicated to presenting chamber music of the highest quality. Recent performances were presented by the New York City Classical Guitar Society, Victoria Bach Festival, Austin Classical Guitar Society, Guitar Houston, Texas Music Festival, Troubadour Series at Wofford College, University of Texas at Brownsville Guitar Ensemble Festival and Competition, and Austin Chamber Music. The Texas Guitar Quartet has been part of the Texas Commission on the Arts Touring Artist Roster since 2010. This concert is supported in part by an award from the National Endowment for the Arts. Art Works. And by the Texas Commission on the Arts. Scenes from the film score to Alfred Hitchcock's "The Lodger"